Project Details: This website was created to facilitate the Open Doors ONE WITH THEM campaign that coincided with the International Day of Prayer for the Persecuted Church (IDOP) in 2011. 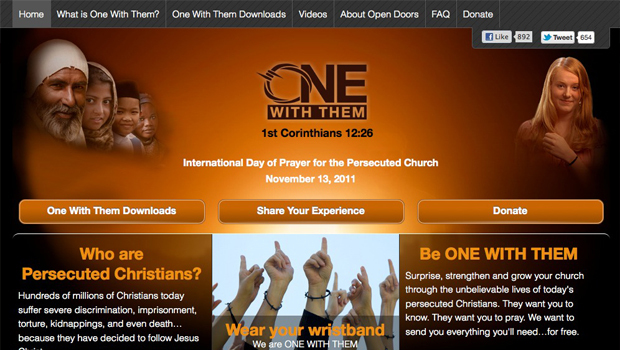 The campaign encouraged users to sign up to receive free wristbands as a reminder to pray for persecuted christians. In addition, users were encouraged to sign up for download materials for IDOP. Design/Development: The ONE WITH THEM website was designed by Contexture International and after being given the PSD I converted it into a fully functional WordPress website. The design was converted to fit the 960 grid (Nathan Smith). Website Features: Custom social media links, sign up forms, donation API, video lightbox, custom download center, custom rotating banner.